However well-fitting the dentist has made the dentures, they can never provide the biting and chewing efficiency of natural teeth. 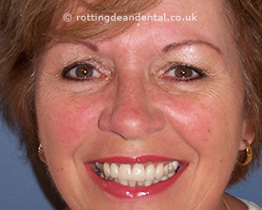 Using a denture fixative will help to give confidence and dispel many fears about wearing dentures. 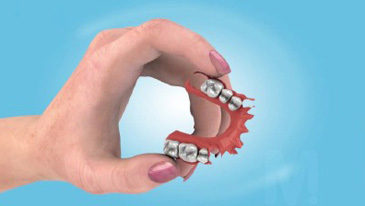 Even well-fitting dentures can benefit and become more stable and secure. The ingredients work together to hold the denture in place and provide a strong and lasting hold that can help to reduce the wobble, so eating apples, crusty bread and other foods can be enjoyed again. 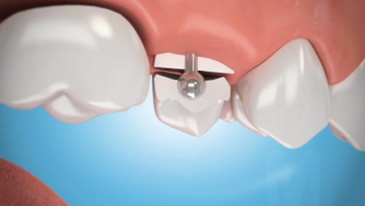 It is a good idea to develop a regular routine for cleaning dentures. Cleaning them at the same time as any remaining natural teeth will make sure that it is done regularly. Whatever the type of denture, it is best to rinse it after every meal and remove any debris with a soft brush, a denture cleaner and warm water. 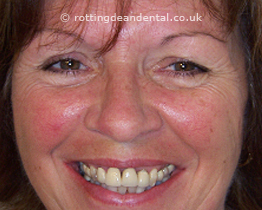 Dentures should be cleaned over a basin half-filled with warm water to minimise the risk of damage they are dropped. Brushing is the most essential aspect of cleaning a denture. Soaking a denture in a cleansing solution alone is not enough. Use a brush (a large toothbrush is fine) to reach into all the crevices of the denture, especially the fitting surface (the part that contacts your gums) and, in the case of partial dentures, inside any metal parts such as clasps. Using a specialist denture cleansing paste is probably the most effective way of removing food debris and bacterial deposits (plaque) and preventing the build-up of stains or tartar. 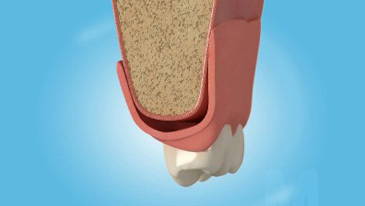 Deposits of tartar (a bit like the 'fur' in a kettle) are less likely if your dentures are always kept clean. However, they can be a problem for some people. 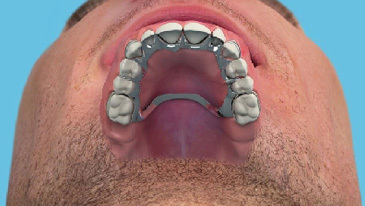 No commercially available denture cleanser is effective in removing such deposits and this needs to be done professionally by your dentist or in a dental laboratory, where your dentures can easily be descaled and repolished.